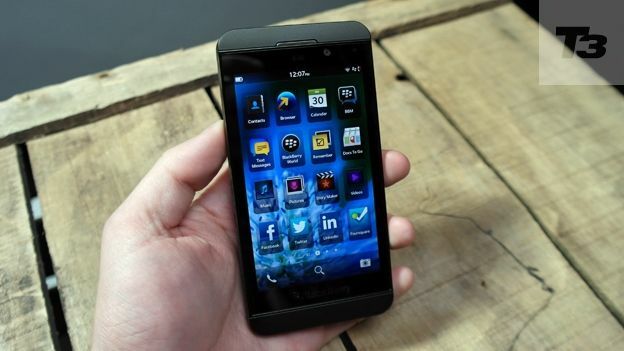 Is the new BlackBerry Z10 the saviour the brand needs it to be? The BlackBerry Z10 has finally arrived after what has been a very tough year for the company and with the rumoured iPhone 6 and Samsung Galaxy S4 handsets due to land in 2013, the battle has only just begun. Launched alongside the physical keyboard-toting BlackBerry Q10, the Z10's current competitors take the shape of the iPhone 5, Samsung Galaxy S3, HTC One X and Nokia Lumia 920. But has it got what it takes to make it into our list of the best smartphones around? Read on to find out. Hold it in your hand and you'll be forgiven for being less than overwhelmed with BlackBerry's new smartphone. The understated design is available in either all-black or a slightly more eye-catching white on black. A large glass front is then sandwiched by two plastic ends with a slightly rubberised back covering the rear. With the functional 'substance over style. stealth-like aesthetics, the Z10 is something that we would imagine to be as comfortable in the hand of a bat-obsessed crusader as a businessman. Measuring in at 130mm x 65.6mm x 9mm it might be considered 'chunky', however thanks to the build quality it instantly moves into the realms of 'durable' rather than 'heavyweight'. It feels like a phone that was made for a marathon of suit trousers, coffee spills and desk-level drops. With a 4.2-inch 1280x768 display, the Z10 boasts a pixel density that exceeds the iPhone 5. While it may not be able to combat the sun as well as Apple's handset, it makes up for it in sharpness. The Z10 boasts a fairly sizable bezel, something other smartphone makers are hastily trying to remove. The reasoning for this is actually the software itself - BlackBerry 10. Many of the main gestures in BlackBerry's new OS are done by swiping from off the screen onto the display. with a swipe up from the bottom acting as both the 'Home' action and also as a way to unlock the phone. A swipe upwards from the bottom of the screen acts as both the 'Home' action and also as a way to unlock the phone. Once unlocked you're greeted with what looks to be BlackBerry business as usual - a series of app icons split up over windows with an unlimited number allowed. Apps can be minimised by swiping up, turning each one into an 'Active Frame' which then remains in a window next to the apps. Essentially minimised apps, the Active Frames can also function as live widgets showing realtime updates on news stories, giving you essential calendar information or even showing you the weather at your location. You can have up to 8 running at any one time. You can see that BlackBerry has created these as an alternative to Android's widgets however it's more a halfway house at the moment with some apps like the Guardian showing a brilliant slideshow of news images while some others show an infuriatingly tiny version of the app screen. Central to BlackBerry 10 is the Hub - a stream of notifications encompassing all your accounts including Gmail, Twitter, Facebook and LinkedIn, showing you everything from messages to birthdays. It's certainly an impressive feature and something we can really see business users and heavy social network addicts appreciating. To help appease the business users, BlackBerry Balance has been created, essentially splitting your Z10 into two halves. It lets you switch between work and personal with the two being completely cut off from the other, avoiding any potentially disastrous situations involving your holiday snaps and a business presentation. To get your mitts on apps you'll need to use the BlackBerry World app store where you'll find the usual mass of overpriced stock exchange apps but also some more pleasant surprises including recent HD films, pretty much the entire singles music chart and some apps you'll actually recognise. In fact there's over 70k apps available at launch and confirmation of yet more big names including Skype and WhatsApp with Instagram likely to appear as well. One of the big new features to land on BlackBerry 10, BBM has been given an upgrade letting you perform crystal clear voice calls as well as video calls on the 2MP front-facing camera with other BBM users, rivalling both Skype and Apple's FaceTime service. BlackBerry 10 also includes Story Maker, which is BlackBerry's version of iMovie. This is a simple movie editing app that aims to take the hassle out of creating a short home movie. You can add videos or images and then apply any soundtrack of your choice. Six filters are available and then once complete it'll be rendered in HD where you can then upload to YouTube. A feature exclusive to BBM, Screen Share lets you do exactly that. At the press of a button you can share your screen with the person you're having a video call with whether it's a YouTube video, internet page or contact information. Clearly implemented as a business focused feature, Screen Share also has social potential. BB10 also gives you BlackBerry Remember - the brand's answer to the popular app Evernote. Whether it's a shopping list or a project, you can create a workbook and then fill it with images, videos, documents or music. You can also add voice memos and emails to help remind you. All of these apps require large amounts of memory and that's where the specs list comes in. Under the hood you'll find a 1.5GHz dual-core processor, which may not sound like much but it's actually on par with Sony's flagship Xperia Z and most of the Nokia Lumia range, making the handset pretty zippy. You also get a very impressive 2GB of RAM, something which at present is limited to high-end Android tablets. Hidden inside you'll find a 4G antenna which means you'll be able to use the current 4GEE service from EE and also any upcoming 4G networks. NFC comes as standard as well letting you add BBM contacts and send images. There's also a Micro HDMI which means you'll be able to throw the latest HD films and TV shows from BB World straight up onto your HDTV. Onto the keyboard - the bit that every self-respecting BlackBerry fan wants to know about. The moment you start adding accounts the Z10 will actively sweep your emails and texts, learning the language you use and creating a catalogue of common phrases. This means that when you start typing it'll intelligently predict words that only you're likely to use. In short the keyboard is very good, and while there will be those that simply can't cope with the lack of a physical keyboard, this is one of the best touchscreen keyboards we've seen. BlackBerry claims to have paid as much attention to the camera with the Z10 sporting an 8MP snapper on the back and a 2MP front-facing camera for video calls. One of its key features is Time Shift where you can take a picture of a group and then change each face to several seconds back or forward until you've got them all with their eyes open (or closed if you're feeling mean). The camera itself is reasonable - images are very clear but a little dark and rather oddly, you have to drag and drop where you want to focus making it a less than speedy process. Is this the phone to save BlackBerry? Some would argue that it has to be and in many ways, it is. By creating BlackBerry Balance, the maker has shown that it can still be the smartphone of choice for businesses. For the rest of us all the features that make it such a capable work phone are then focused on making it a social phone. The Z10 will certainly win over BlackBerry fans and if they can get the big apps released soon then they could well steal back even more users, but we can't seem them winning over iOS, Android and WP8 in huge numbers. In a world where everything is 'quad-core' and 'next-gen' the Z10 still manages to fight through the noise by being quietly efficient suggesting that BlackBerry may have won the first round, but only just.